KPMG R.G. Manabat & Co. (KPMG RGM&Co. 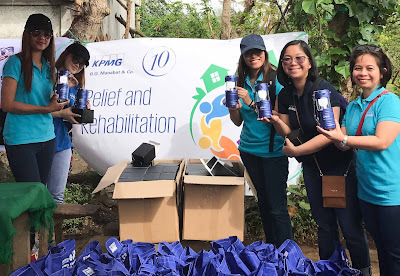 ), the Philippine member firm of KPMG International, recently conducted a donation drive and relief and rehabilitation operations for the benefit of Typhoon Nina victims in the Bicol region. The firm partnered with JLo Big Heart Foundation, Inc., a DSWD-accredited non-profit organization based in Pili, Camarines Sur. KPMG RGM&Co., its partners, principals, and employees contributed cash to purchase 500 rechargeable solar lamps and shelter rehabilitation kits consisting of basic construction materials to help build homes of families in the affected areas. The firm’s tax partner and people, performance, and culture department head Maria Myla S. Maralit, together with senior manager Joselle Anne Marie G. Sanchez and volunteer employees, joined volunteers from JLo Big Heart Foundation, Inc., headed by Ms. Mariefe N. Maralit, to distribute the lamps and shelter rehabilitation kits to affected families in San Roque Communal, Ocampo, Camarines Sur; Rotary Village Community, Pili Camarines Sur; and Bagong Sirang, Pili, Camarines Sur. Other beneficiaries include affected families in Saguring and San Jose, Pili, Camarines Sur. A total of 510 families were beneficiaries of rechargeable solar lamps, ten of which were recipients of shelter rehabilitation kits. Two hundred lamps were also given to affected families in Bato, Catanduanes through Mayor Leo Rodriguez. Typhoon Nina struck the Bicol Region last year affecting a total of 446,496 families. The donation drive and relief and rehabilitation activity is part of KPMG RGM&Co.’s corporate social responsibility program.